Photograph of tequila bottle and decorative box. 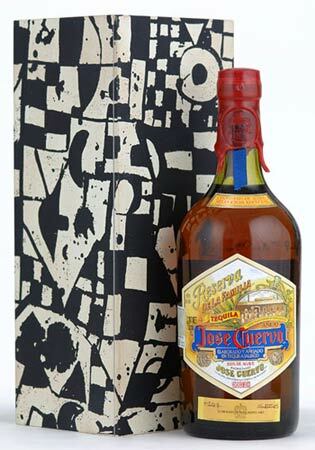 Jose Cuervo Reserva de la Familia Tequila 2006 Collection in a box designed by Mexican artist Sergio Hernandez. Each year Jose Cuervo uses a different Mexican artist to decorate the box holding the Reserva de la Familia tequila bottle. For this 2006 collection Jose Cuervo presents Sergio Hernandez, native of Oaxaca, Mexico, whose great sensitivity is reflected in this artist's creative ideas. Sergio Hernandez received his training from the National School of Painting, Sculpture and Engraving "La Esmeralda", of the National Institute of Fine Arts, Mexico CIty, Mexico from 1975 to 1981. Previously he studied at the National School of Fine Arts, San Carlos Academy, National Autonomous University of Mexico (UNAM), Mexico CIty, Mexico from 1973 to 1974. His work is widely shown in Individual Exhibitions around the world. Excerpts from the 2006 collection flyer from Jose Cuervo. Text from the card inside the box - copyright Jose Cuervo.